Nubia X: Smartphone with 2 displays & without notch - the best concept? Review Nubia X: Smartphone with 2 displays & without notch – the best concept? Anyone who has been involved with smartphones from China for some time knows that a smartphone with two displays is not a novelty – keyword: YotaPhone. The Nubia X goes the same way and also uses two displays. But you also do without a front camera. The best solution so far for the Notch problem? The new flagship reminds us directly of the Nubia Z17 due to its general design, but the big difference is of course two displays: where is the front and where is the back? This can be easily distinguished by the camera, which, as already mentioned, is only present on the back. Accordingly, on the front we have a 6.26 inch IPS LC display. Online we were talking about a 2.5D glass, but we can’t confirm that. The front is completely flat, only the housing frame brings a curve into the device. With dimensions of 154.1 x 73.3 x 8.4 mm, the Nubia X is somewhat thicker due to the two displays, but also slightly shorter than a Xiaomi Mi 8 without Notch. The 181 g total weight is also really ok. Finally, the manufacturer relies on an aluminum finish, at least in the case frame. This holds the so-called “glass sandwich” together. The special feature, however, is the display on the back. Anyone hoping for a display equivalent to the main screen could be disappointed. After all, Nubia “only” uses a 5.1 inch OLED display with an HD resolution of 1520 x 720 pixels. In order to realize the second display in this way, Nubia had to place it on a glass back. Logically, the display doesn’t take up the whole back. To the left and to the right there is 0.9 cm space, to the top and bottom the distance is even bigger with more than 1.5 cm. Nubia is also “innovative” when it comes to positioning the fingerprint sensor. There are two directly, one on each side of the housing frame. So there is no in-display fingerprint sensor like the OnePlus 6T. 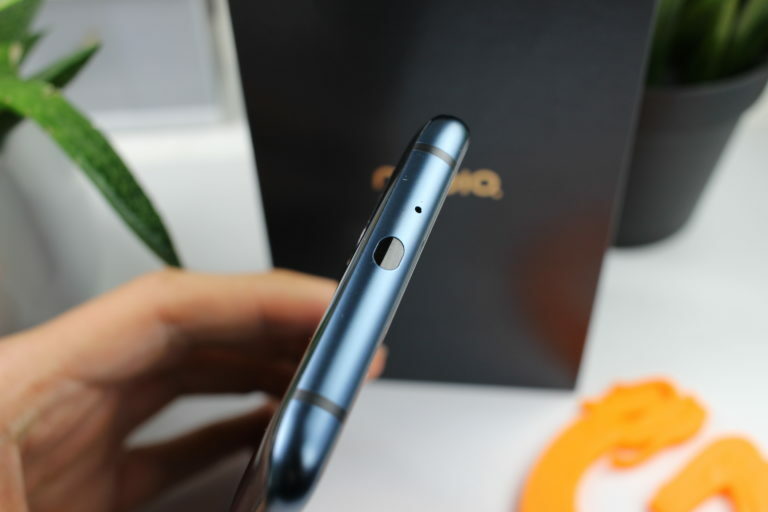 The handling of the Nubia X is really on a very high level, because the manufacturer manages to round off the long sides on the back very pleasantly. You won’t even notice that you have a second display on the back. This is perfectly integrated in the back without any kind of transition between the back and the display. This level of workmanship runs through the whole smartphone, you can feel Nubia’s expertise on every millimetre. Only the transition between the case frame and the front looks sharp-edged, but this is due to the foil applied by the manufacturer. Apart from that, there are no flaws, because the keys also have a pleasant pressure point and the slots and the loudspeaker grill are precisely milled – hat off. 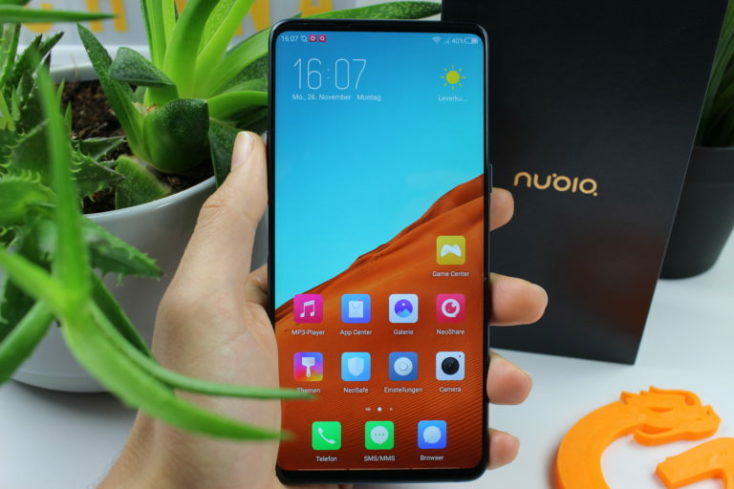 The handling alone makes the Nubia X even more pleasant than the Xiaomi Mi Mix 3. This is mainly due to the rounded back and the smaller size. Moreover, it simply feels like a “normal” smartphone. After all, you can’t see the back display and there’s no slider mechanism or notch. This gives you the feeling that you don’t have to compromise. One notices that the displays are two different panel types. Front IPS and rear OLED. The back screen is darker than the main display and the colors are warmer overall. But it’s an OLED panel, so we can also use the Always-On mode, which was already preset. A disadvantage of the back, however, is definitely the susceptibility to fingerprints. 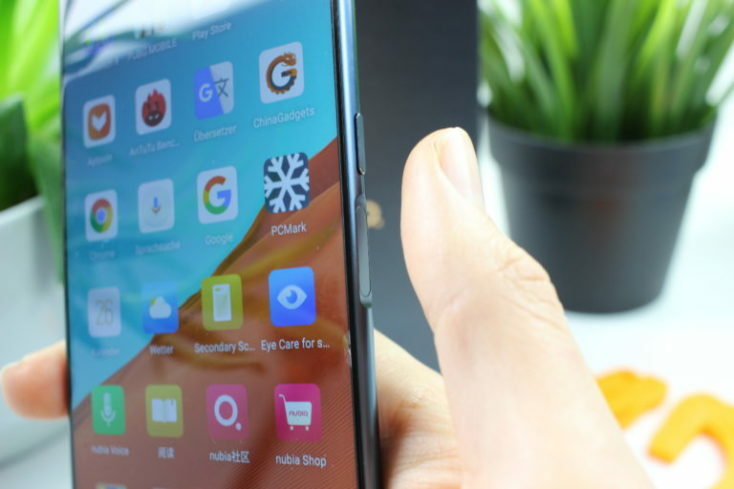 Anyone who has ever held a Xiaomi Mi Mix 2S knows how quickly such a glass back can be “smudged” by the fingers. The main display is reasonable for the price and offers an overall good brightness. Especially in contrast to the display on the back you notice that it’s a Full HD+ resolution of 2280 x 1080 pixels. The viewing angle stability is very good and the sensitivity of the panel also leaves nothing to be desired. Overall, the color profile is somewhat colder, but can also be adjusted in the settings. If you set it warmer, you adjust it to the back panel display. Because here you notice that an OLED is at work. The colors are much stronger, the contrast much higher and in terms of brightness the smaller display is at least at eye level with the IPS panel on the front. You definitely have to deal with a full-fledged display on the back that even supports multitouch inputs with up to 10 fingers. Also the sensitivity is not affected in any way. Even though 5.1 inch diagonals now sound “small”, you have to keep in mind that this is still bigger than the display of an iPhone 6/7 or 8. All in all, you have to admit to Nubia that the second display isn’t just a gimmick, but really a full screen that really looks and works very well. You can see that the manufacturer has focused its attention on this and invested its working time in optimization. You can also see that in the setting options. Nubia leaves various customization options here, but we’ll go into that later under the aspect of “software”. There are two ways to switch between the two displays. Nubia’s intention is to keep the two fingerprint sensors pressed left and right and then rotate the smartphone 180°. The Nubia X also uses vibration feedback for this purpose. Theoretically this works quite well, but in practice such a 180° rotation is very crampy when the sensors are held down. This can be avoided in two ways. Either you turn the smartphone first and then press both sensors. Or you decide in the settings for the software solution. Then, one can simply use a software button on the display that one has to press in order to switch between the displays. 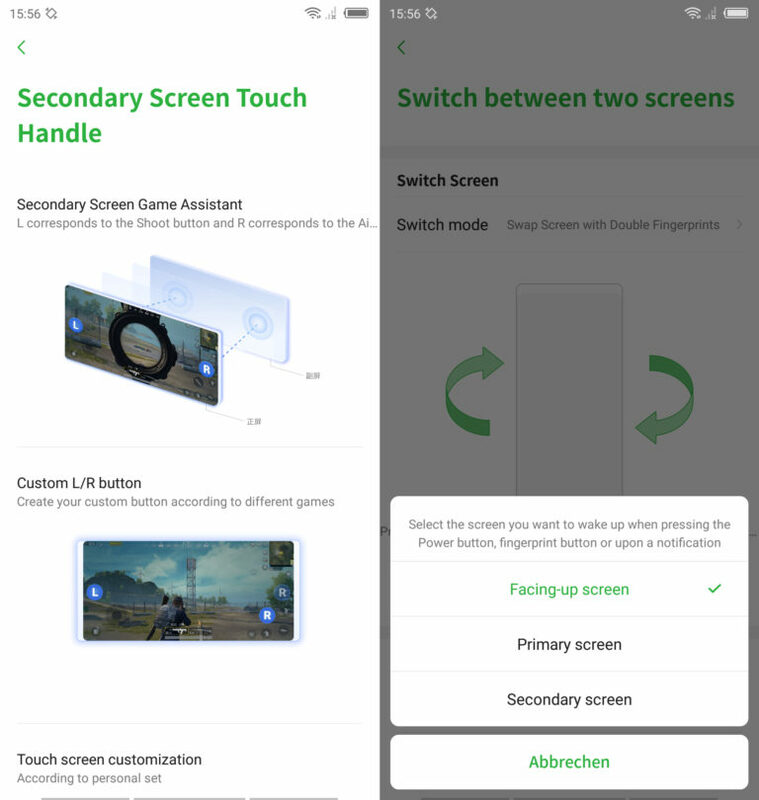 Actually one should be able to use the back display also for it, in order to occupy for example with PUBG mobile, “shoulder keys”. Similar to a controller of a console, you could play a bit more pleasantly. However, this has not worked for us so far, the “Touch Handle” can only be used in landscape mode and we actually did. Nevertheless, this mode could not be activated. Maybe Nubia will fix this in the future with an update. Top-Smartphone 2018 means with the highest probability that the Snapdragon 845 will be used. So the Octa-Core processor with up to 2.8 GHz can also do its work in the Nubia X and is accompanied by 6 or 8 GB LPDDR4X RAM and 64 or 128 GB UFS 2.1 memory. However, the memory cannot be expanded. Like any other smartphone with this CPU, the performance is beyond all doubt, you can expect this for the price. The Nubia surface also knows how to handle the CPU quite well. The opening and closing of apps goes wonderfully by the hand, navigating through the operating system is lightning fast. I didn’t notice any delays, even with more than 15 opened tasks the smartphone can cope very well. Even if you want to play a round, of course it’s absolutely possible. No matter if PUBG, Tekken or smaller games, you don’t get the X to its limits so fast. The benchmark tests proved that again. The only really unusual thing is the Geekbench benchmark, which scored “only” 7606 points in the multi-core score. 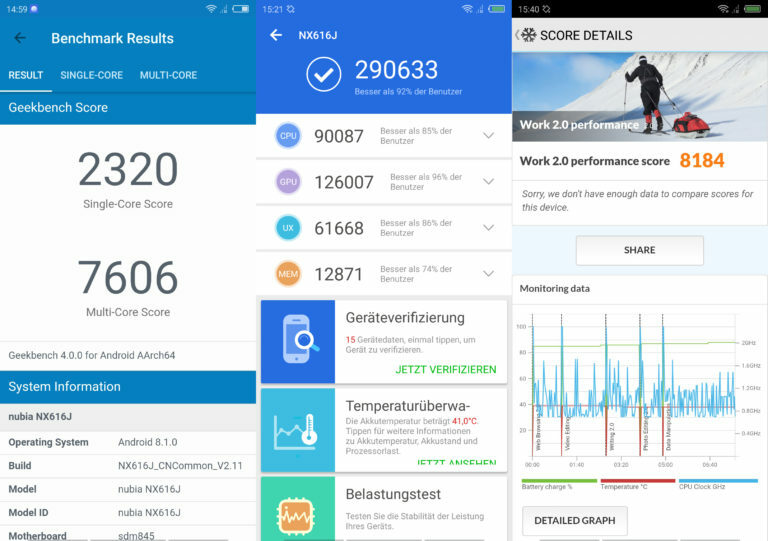 For example, the Pocophone F1 scored over 9000 points in the same benchmark. On the other hand, the AnTuTu benchmark is significantly higher than that of the Poco F1. On the other hand, the X has a relatively large 3.800 mAh battery, which at least has to supply two displays with power. There were many critical voices in advance: “Then the battery life will be really bad”. But no, the battery life is definitely not bad. With almost 9 hours in the battery benchmark, Nubia still manages a very decent value here. In this case, however, this depends even more on the use of the mobile phone than usual. Surprisingly good battery life for a mobile phone with two displays! Theoretically, you could use the Nubia X all the time only on the small, energy-saving display. Of course, this is more of an extreme scenario, but you can save yourself if you run out of battery power on the way. But the charging speed is really outrageous. Because Nubia X promises Quick Charge 3.0 with the included charger. But we can’t confirm a quick charge in the test. In the first 30 minutes, only 30% more was shown on the battery display, the charging process from 20% to 100% took well over an hour and 30 minutes. Due to the secondary display on the back, wireless charging of the Nubia X is unfortunately not possible! The charger promises 18W, but unfortunately cannot deliver it! 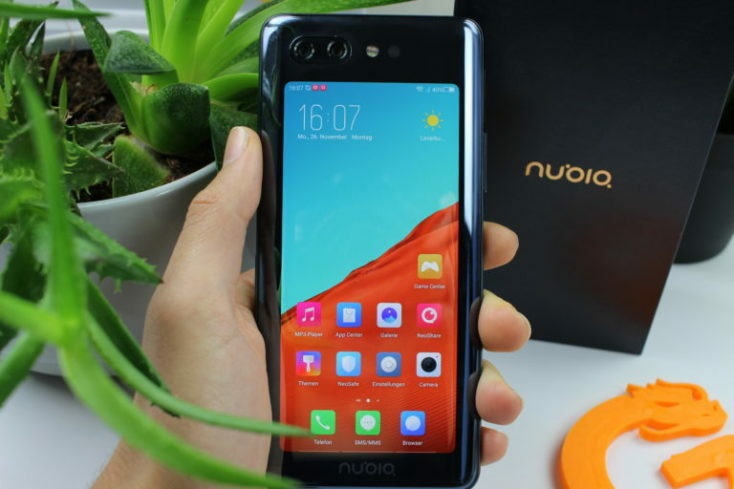 The Nubia Z17 Lite in the middle class, for example, already showed that Nubia is well versed when it comes to installing good cameras. All in all there are “only” two cameras in the Nubia X, which in contrast to an Honor Magic 2 with six cameras sounds disadvantageous at first. The dual camera consists of a 16 megapixel sensor with ƒ/1.8 aperture and a 24 megapixel sensor with ƒ/1.7 aperture. The secondary sensor should be especially in portrait mode. In addition there are two flashes, one with particularly soft light for Selfies. “Just” two cameras in one flagship? But for good reason! Keyword Selfies: This is also recorded with the main camera on the back. Just like in the pre-front camera era, you have to turn your mobile phone for a self-portrait. However, the second screen is used, so it basically works just like a selfie – Chapeau Nubia, very clever! This also means that the Selfies are just as good as the photos from the main camera. For such a prestige smartphone, Nubia has apparently invested too little time in optimizing the camera. The results of the main camera are perfectly ok and by no means bad, but compared to Xiaomi you get a better quality for the same money. The autofocus doesn’t work quite as reliably, especially in the background you quickly lose details and the colors don’t quite suit my taste. I’d rather compare the overall camera quality with a Xiaomi Mi A2 or Mi 8 Lite, but they only cost half as much. The low-light behavior is even quite good. The photos aren’t quite as bright as in Xiaomi or Google, but they also get by with relatively little image noise. Unfortunately, the portrait mode can really be forgotten. The edge detection is very inaccurate, the bokeh effect too spongy and also the sharpness leaves much to be desired. The competition is simply further along – too bad! The Nubia gets along quite well with artificial indoor light. The Nubia can still produce useful photos even in poor lighting conditions. But thanks to the main camera the Selfies are on a good level compared to the competition. The sharpness is really very good, the colors I like well and the autofocus works reliably – at least with photos. The Selfie light also helps in poor lighting conditions. 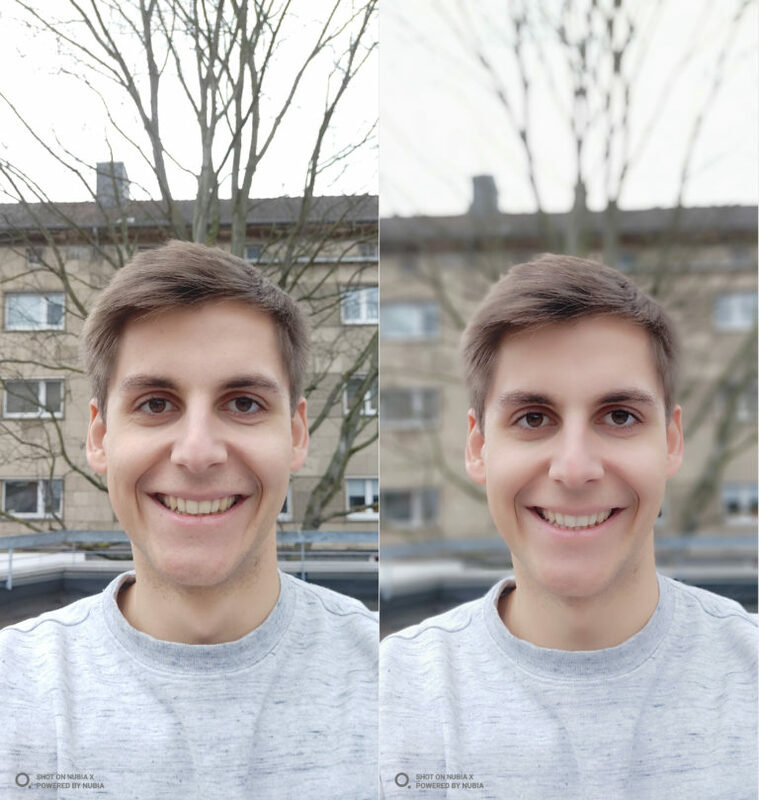 The rotation of the smartphone is absolutely okay and in my eyes more pleasant than the rotation of the Xiaomi Mi Mix 2S with the front camera on the underside. But also here you should leave out the portrait mode. This is simply too imprecise and too artificial to achieve the desired bokeh effect. The video recordings leave with me some ambivalent impression. Because the colors please me really well and seem lively. However, they are not stabilized and also the autofocus is a bit slow. In addition, you can’t make any adjustments. Neither frame rate nor resolution can be adjusted, so no 4K shots are possible. The probably most underestimated highlight of the Nubia X are the two fingerprint sensors that are located on the right and left side of the case frame. They are placed slightly above the center and are perfect for my fingers. This works so well that I’m really surprised why other manufacturers (apart from Sony) haven’t yet really placed their bets on the side fingerprint sensor. First of all, it’s especially practical that you can set up two fingerprints directly, so you can unlock the phone with both the left and right side. Secondly, the operating system also allows you to go back in a menu with the sensors and also go back to the start screen. You can also use both sensors together to change the display! 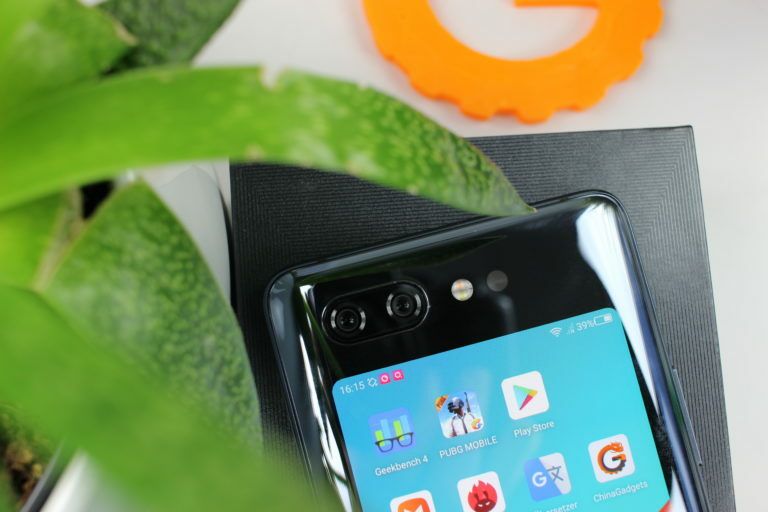 When it comes to connectivity, ZTE’s partner company uses almost all important standards: Dual Band AC-WLAN, Bluetooth 5, GPS and USB Type-C. Even western LTE tapes are available, even if the Nubia X is only intended for the Asian market. 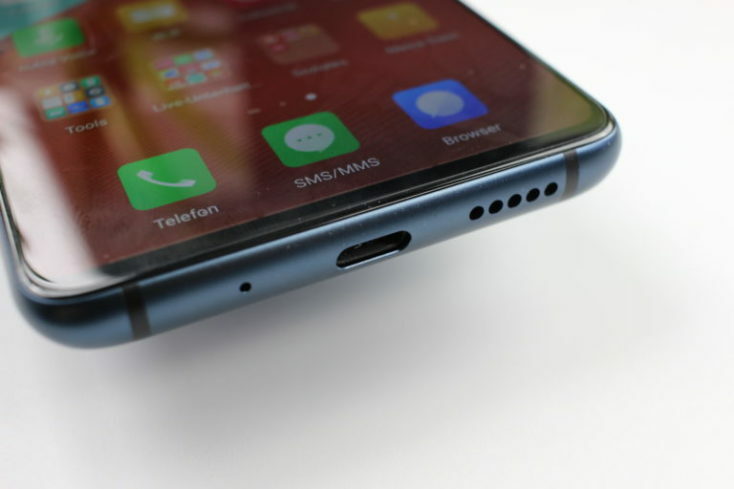 A 3.5 mm jack connector and stereo speakers are not required. USB Type-C is available, 3.5 mm jack unfortunately not. But an adapter is included! 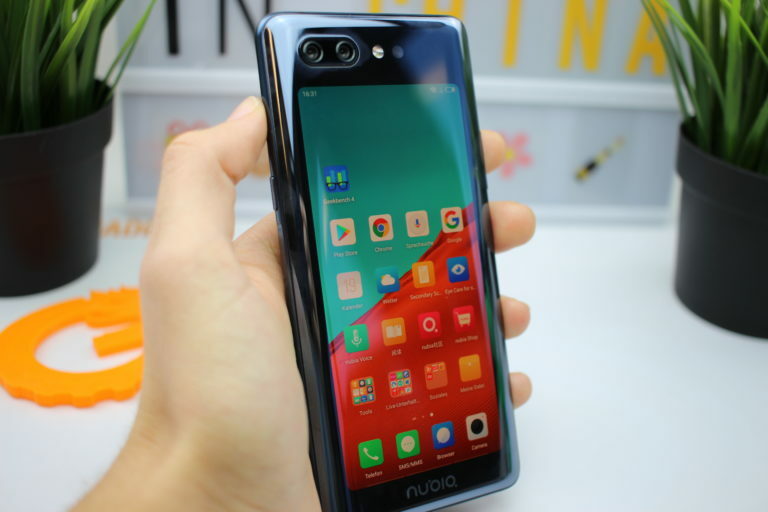 Due to the second display the Nubia X lacks space. 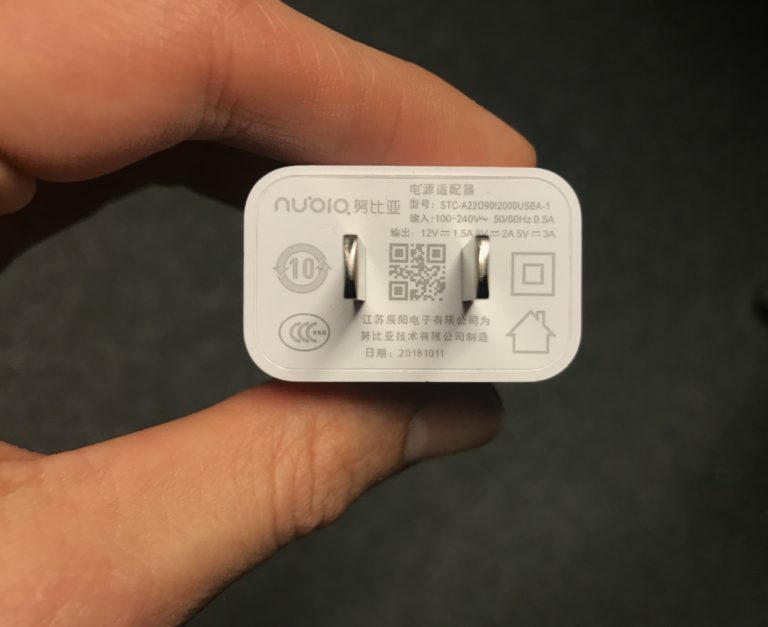 Accordingly, the manufacturer did not manage to install an NFC module or a Qi charging coil. Wireless charging and contactless payment is therefore unfortunately not possible! 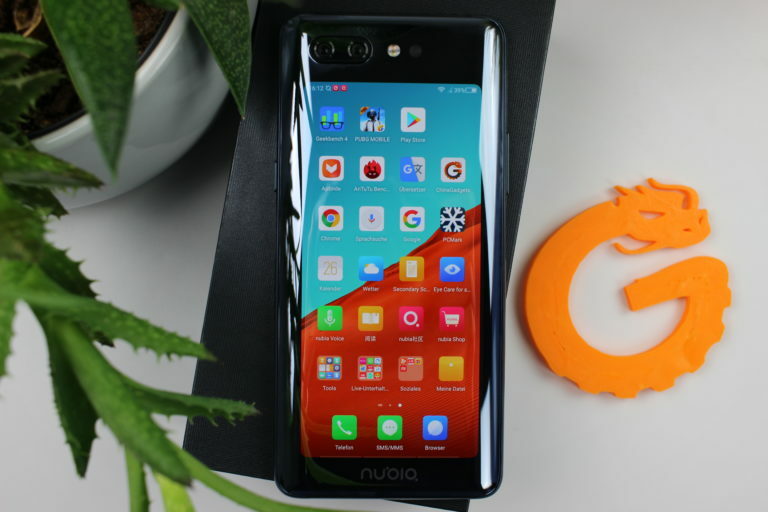 The fact that the Nubia X is only intended for China is particularly noticeable in the operating system, which is initially only available in Chinese and English. Nubia UI 6.0 is an adapted interface and is based on Android 8.1. So you are not on Android 9 Pie here yet. Although the language of the operating system can still be set afterwards, the translation is more bad than right. In addition, it only works to about 50%. 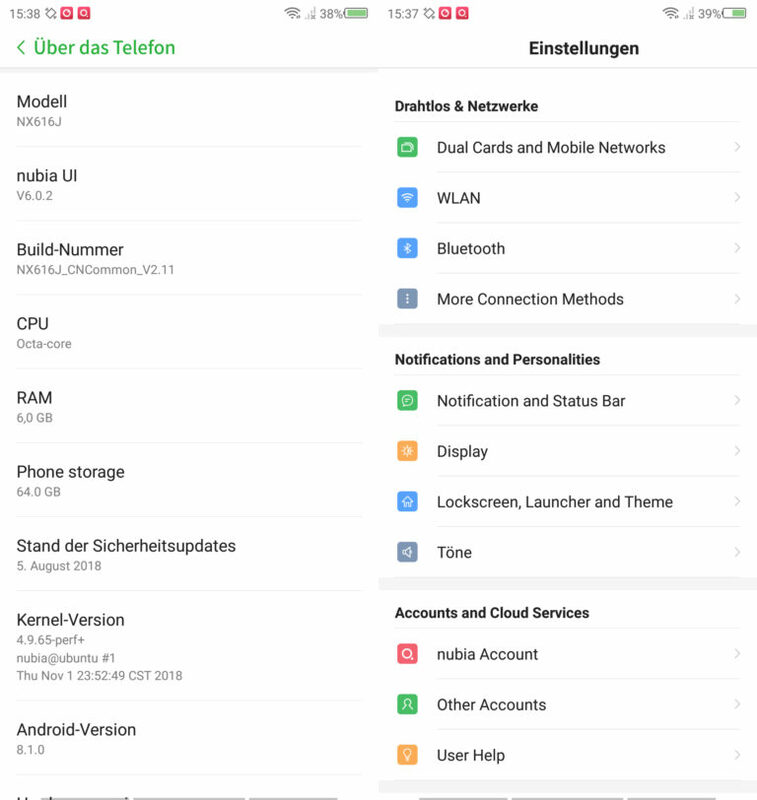 App names are partly in German, English and Chinese, the settings almost exclusively in English and some apps completely in Chinese. These apps, we like to call them “Bloatware”, can fortunately all be uninstalled. After the setup you should invest a few minutes and free the device from unnecessary software. But it can already be said that the operating system offers some really interesting features. I was particularly interested in “FIT”, which allows you to use additional gestures. An example: by moving two fingers simultaneously along the left and right edge of the display, you can adjust the brightness – very cool! This of course also includes the seamless transition between the two displays when you turn the Nubia X. But the much bigger problem is that Nubia UI 6.0 does not support Google Services. So far we haven’t been able to install the Google Play Store or other Google services. Apps like the Geekbench benchmark could only be installed via .apks from the browser. We also used the Third-Party Play Store Aptoide, which makes it much easier to download many of the most common apps. However, these only work partially. The mentioned benchmarks worked almost without problems, but our own China-Gadgets app doesn’t start either. Services such as Google Chrome or Google Language Search can be installed. If you want to open them, however, we can see how the OS closes the apps directly. So far we couldn’t avoid this and we have to live with the fact that these services and apps can’t be used at the moment. This could be fixed if Nubia releases an update and/or the Global ROM. Then you could flash the Nubia X and install the Google services. Alternatively we have to wait for a possible global version of the Nubia X! In my eyes, Nubia has managed not to get lost with the Nubia X in all the new smartphone launches in October, but has probably even managed to present the most interesting concept. But that’s probably the biggest problem. It is, at least for us in Europe, still not more than a concept smartphone, but a very well implemented one. The software is the biggest criticism of the Nubia X, because the dual display design is an interesting approach and really well implemented! That really impressed me. And the WOW effect is definitely given! Another problem is the vulnerability. Here I would like to quote one of our users: “You have two jam sides”. Means: without Case the probability of a display break is naturally extremely high with fall. And who will repair it? To be fair, this also applies to the other concept smartphones like the Xiaomi Mi Mix 3, Oppo Find X or Vivo NEX. So in my eyes the Nubia X is unfortunately (still) nothing more than a concept smartphone and not completely mature. 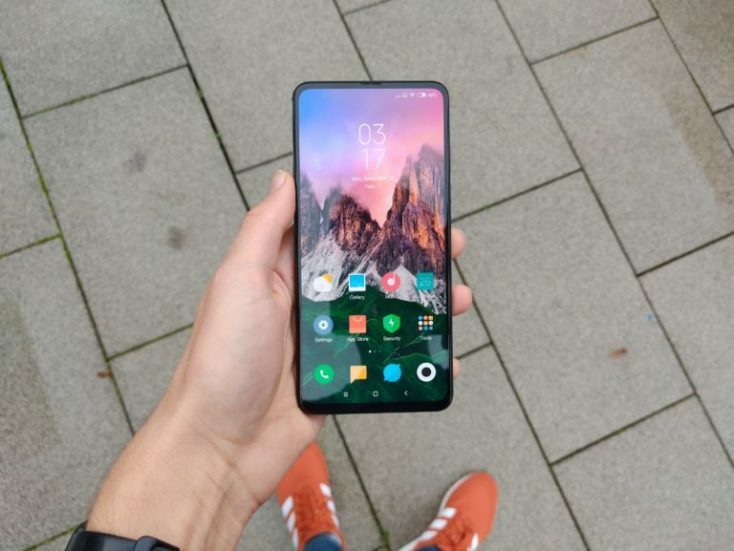 Here the Xiaomi Mi Mix 3 is just two steps further and more finished. That’s why I’d advise if you’re interested to definitely wait for a global version!